The following text was contributed by the Government of Mexico. In Mexico, the Open Government Partnership has become a space for dialogue and exchange of ideas that allows the government -in collaboration with civil societyto take on commitments linked to the four principles of Open Government and with the potential to transform people’s quality of life. The Federal Government's commitment was made manifest from the first address given by the President of the Republic of Mexico, Mr. Enrique Peña Nieto, in which he proposed an Open Government, capable of listening to all voices in society. The 2013-2015 Action Plan is the result of an open and collaborative process between civil society, academia, entrepreneurs, experts and government officials. 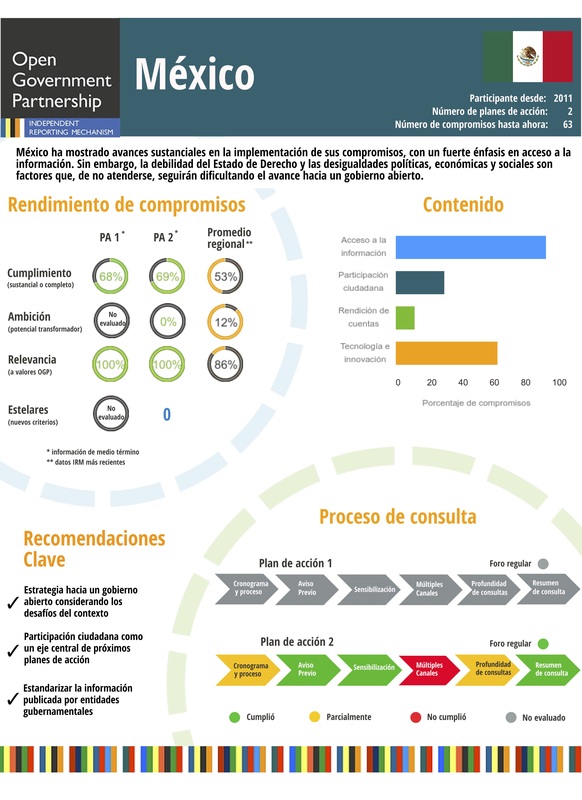 The process of formulating the PA15 is evidence that the participation and collaboration of citizens in public affairs allows the identification of commitments to meet citizens' demands, aimed at generating impacts of high public value and potential to improve the conditions and quality of lives of Mexicans. The execution of the PA15 is guided by a methodology that includes monitoring and evaluation as well as the development of work plans for each of the commitments agreed between government officials and CSOs, who will establish targets and indicators for each semester. All this has been possible thanks to the efforts of the Technical Tripartite Secretariat (STT) with one representative from government (Coordination of the National Digital Strategy), one from civil society (Transparencia Mexicana), and one from the Federal Institute for Access to Information and Data Protection (IFAI).